What's the best video converter to change .avi to .wmv? Or how to convert AVI to WMV for playback with Windows Media Player? It is true that many users desire to decode AVI vidoes to WMV with the help of video converter. But, the truth is that they often spend much time on figuring out the suitable video converter. And unfortunately, these awesome video converters failed to transcode AVI to WMV. For this reason, in this article, we list top useful video converters for Mac/Win to easily convert from .wmv to .avi. * Convert 720P/1080P/4K/8K AVI video to WMV on Mac/Win with 98% quality reserved. * World's No.1 fast conversion speed thanks to its Intel Quick Sync Video hardware acceleration support. * Compress AVI files to a smaller size suitable for mobiles. * Flawlessly convert video among all sorts of HD and SD videos, for example, convert AVI to MP4, MKV to MP4, FLV to WMV, 3GP to AVI, M2TS to MP4, etc. * Download AVI/WMV videos free from YouTube, Vevo, Facebook and more 300+ sites in 720P/1080P HD, 4K/8K UHD, etc. 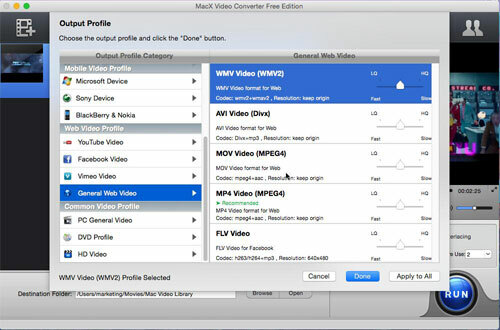 Ahead of converting AVI to WMV, you should download MacX Video Converter Pro on your Mac computer (macOS High Sierra included); if you are a Windows user, you ought to download Windows version (Win 10 supported). Now, follow the below guide to decode AVI files to WMV. Step 1: Load AVI file. Fire up this AVI video converter and click "Add File" button to load your AVI video file that you want to convert. And bactch conversion is supported. Step 2: Choose WMV as the output video format. Go to "General Profiles" category to choose "WMV Video" as the target format in the output profile window. BTW, AVI file converter for Mac/Win also can help to edit the video file by adjusting the resolution/frame rate/bit rate, removing the black bars, adding watermark/subtitles, etc. Specify an output folder to save the output WMV files and hit "RUN" button to start converting videos from AVI extension to WMV extension for playback with ease or easily solving Windows Media Player won't play AVI files problem. 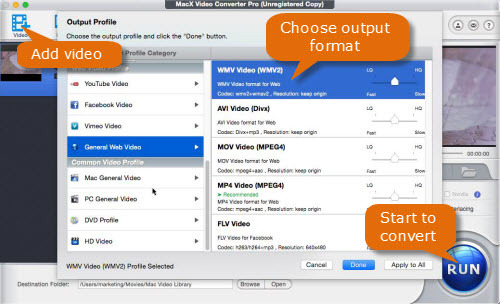 Certainly, this guide also can be applied to convert AVI to MP4 Mac, MKV to AVI Mac, YouTube to MP3, WMV to MOV, etc. A majority of people are eager to convert AVI to WMV free with no watermarks. Here, you can take advantage of MacX Video Converter Free Edition to free comvert AVI videos to WMV with 15X faster speed. In addition to .avi to .wmv conversion, this AVI video file converter also supports almost all video formats conversion: M2TS, MKV, MP4, MOV, M4V, AVI, FLV, AVC, MPEG, WMV, MKV, MPEG2, MPEG1, RM, etc. Besides, it allows you to trim/crop video and add watermark/subtitle to video. Step 1: Add video. Tap "Add Video" button to load AVI video to be converted. Step 2: Select "WMV" as the output format. You can freely convert videos to iPhone iPad Android devices for playback without limitation. Step 3: Hit "RUN" button to start to convert AVI videos to WMV. Some people rely on online video converter to transcode AVI format to WMV because of its convenience. Mostly, there are many available free online video converters like convertio.co, ZAMZAR, Online Converter, FreeFileConvert and more. Users needn't do any download works and just import video files, pick a format to convert and start to convert. 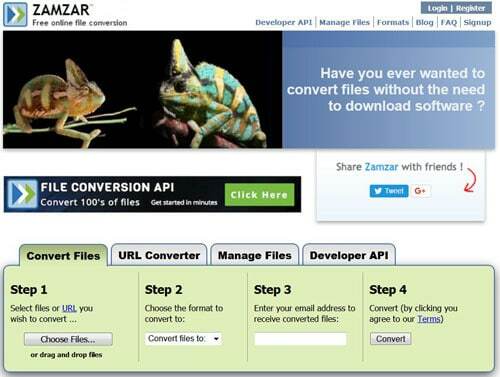 Here, we take ZAMZAR as example to free convert AVI to WMV online. Step 1: Select files or URL you wish to convert. Alternatively, you can directly drag and drop files to the converter. Step 4: Hit "Convert" button to start converting AVI meida files to WMV. Free download the best video converter for Mac/Windows to decode AVI videos to WMV, as well as MKV to MP4, M4V to MP4, AVI to MP4, AVCHD to iPhone, FLV to iPhone, YouTube to MP4/MP3, etc with original quality reserved and world's fastest speed. No virus, spam, ads, etc.